Today I am that bit older. Last night I experienced the most dramatic thunderstorm. 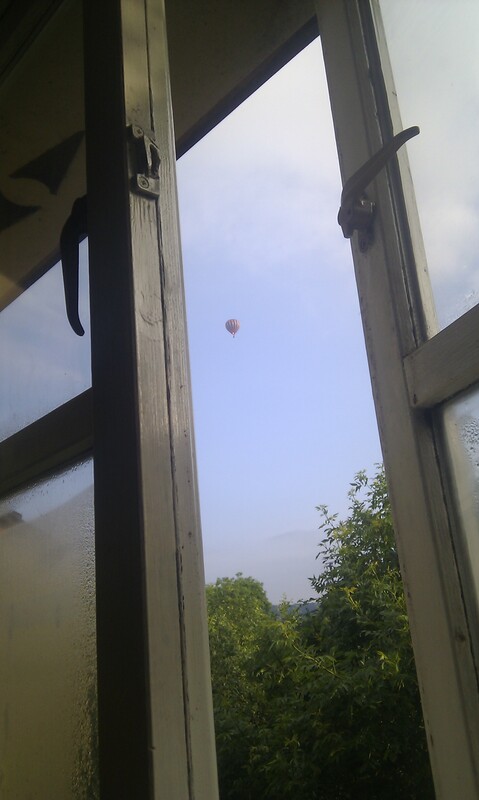 This morning I drew the bedroom curtains and discovered that Stroud was sending me balloons. The picture fails to do justice to the soft, misty morning, and there’s just one balloon – they looked a lot bigger without the camera, and there were dozens, including a penguin shaped one. Best birthday balloons ever! And no storage/disposal issues either. I have been up in a hot air balloon – for my 21st birthday. An amazing thing to do, it’s an adventure I hope to revisit some time. 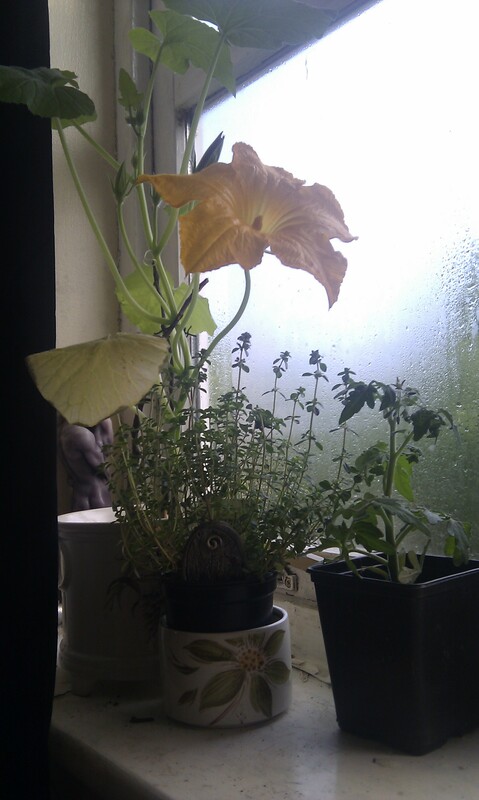 Then, on the other side of the windowsill, there was this going on… during the night, my pumpkin had burst into bloom! We got it as a seed from Down to Earth, Stroud some weeks ago, and despite a life in captivity, it is doing well. Next to it is my thyme plant, with the faerie garden door that the chaps got me. So much cute! (and now, it is the door into time) the third proto-triffid in this arrangement is a tomato plant, which came to stay last weekend and has tiny flowers on it already. Make plant friends… eat their babies. I ave no idea why ore people don’t grow pumpkin flowers for their looks, though. It’s huge, vibrant, and it might lead to a pumpkin. What’s not to like? Today also bought my first Transition Stroud volunteering job (much excitement) and promises cake, and the possibility of shared music. Life is good.